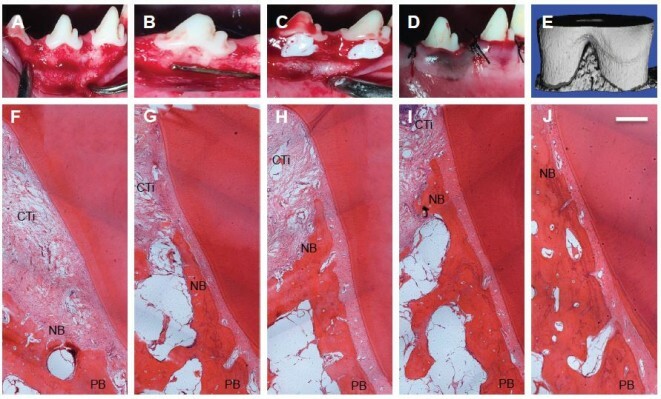 Introduction: Combined therapies utilizing inhibitors to remove pathogens are needed to suppress lipopolysaccharide (LPS)-induced periodontal disease. We prepared a novel, multi-agent delivery scaffold for periodontal treatment. Methods: In this study, we synthesized SP600125 (a JNK inhibitor) and SB203580 (a p38 inhibitor) drug-loaded poly(ethylene glycol)-block-caprolactone copolymer via dialysis method. The physical property of micelles was characterized through dynamic light scattering and transmission electron microscopy. The cell growth and LPS-induced MMP-2 and MMP-13 expression were evaluated through CCK-8, real-time PCR and Western blot assay. The release of SP600125 and SB203580 from different scaffolds was estimated. Microcomputed tomography and histology were used for evaluating the effect of the micelles-loaded nanofibers on the treatment of class II furcation defects in dogs. Results: The drug was then successfully incorporated into gelatin fibers during electrospinning process. We confirmed that the micelles had spherical structure and an average particle size of 160 nm for SP600125-micelles (SP-Ms) and 150 nm for SB203580-micelles (SB-Ms). The nanofiber scaffold showed excellent encapsulation capability, in vitro drug-release behavior, and cell compatibility. Real-time PCR and Western blot assay further indicated that LPS-induced MMP-2 and MMP-13 expression was significantly inhibited by the scaffold. Conclusion: The results suggested that the dual drug-loaded system developed in this study might become a highly effective therapy for periodontal disease.